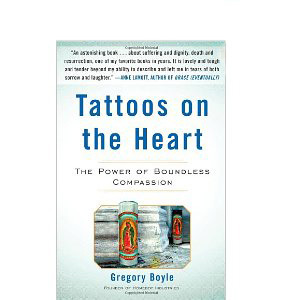 Much has been written about Gregory Boyle, the founder and Executive Director of Homeboy Industries, a social reinsertion program for gang members in Los Angeles, but Tattoos on the Heart is the first book written by Boyle himself. An LA native, Father Boyle has been working with gangs since 1985. In 1992, with a sizable donation from Hollywood Agent Ray Stark, Boyle opened his first business, the Homeboy Bakery, a place where gang members could find employment once they decided to leave gang life. Over the years, the number of businesses has expanded to include Homegirl Café, Homeboy Maintenance, Homeboy/Homegirl Merchandizing, and the most successful, Homeboy Silkscreen. Another important component of Father Boyle's work is the tattoo removal unit, which obviously makes reinsertion possible. However, it is the counseling services and one-on-one discussions with this remarkable man that has led many young gang members down the road to change. But as the book points out, the "success" or the triumph-over-adversary narrative, so prevalent in pop culture, does not happen quickly. In fact, actual progress in the streets is a very slow process, or as Boyle describes it, "three steps forward, five steps back." Now believe it or not, this book is very funny. Boyle tells both hilarious and moving tales of some of the people he has known over the years. He has attended 167 funerals since he began his ministry in1985, and what is most amazing, besides his resilience, is Boyle's ability to see beyond the attitude, tattoos and criminal records, in other words, his faith in those seated before him. Boyle is often asked about his success stories, and he likes to quote Mother Theresa, "We are not called to be successful, but to be faithful." According to Boyle, in salivating for possible instances of success, you overlook the people who carry the heaviest burdens and stop seeing the person seated in front of you. I found this book extremely uplifting. While reading it, I started to think about how quick we are to judge others. The faster we classify and categorize people, the less likely we are to talk to them if they don't meet a certain standard. The root of the problem seems to be our attitude towards success. We live in a success-obsessed society, as if there was no other way to approach life. Yet, I wonder how many people who have attained "success" have actually experienced fulfillment...or maybe I've been reading too much Buddhism. This book is a well-needed reminder that we are not all born with the same privileges in life and that fulfillment may well come through connection and kinship. Homeboy Industries: "Nothing Stops a Bullet Like a Job"
: Tattoos on the Heart by Gregory BoyleTweet this!